After showing property today, I had time to stop by the Post Memorial Art Reference Library to check out the November exhibit. It has been a real joy this year to discover these monthly exhibits. Through them, I have met wonderful local artists and seen beautiful and amazing art pieces. 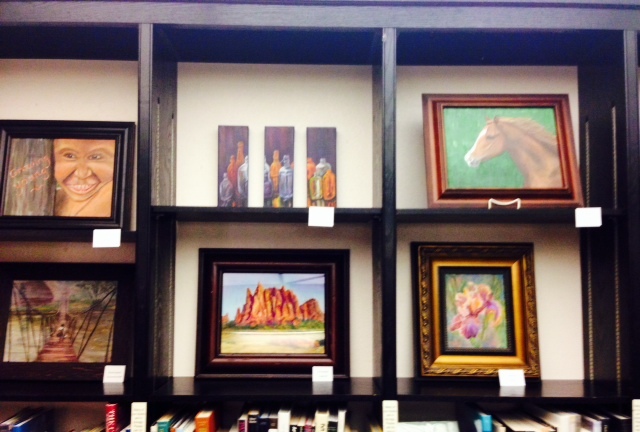 This month’s exhibit features acrylic paintings and pastels by the students of local artist, Pam Leisenring. Pam has taught and worked to promote the visual arts in Southwest Missouri for more than 30 years. She is a co-founder, along with the late Mary Ellen Pitts, of the Southwest Missouri Art Alliance and the Thomas Hart Benton Four State Regional Art Competition and Exhibit held at Crowder College every October. According to the info with the exhibit, Pam specializes in bringing the creative experience to each artist in a very personalized way. By keeping the students on individualized programs and building on their intrinsic strengths, she encourages all to step outside the box and push on to higher levels. Pam introduces a wide variety of techniques, and her teaching style allows for immediate problem solving and increased retention for further application in future projects. Students learn to “see” in a new artistically expanded way, increasing enjoyment and perception of the world around them. All artistic levels, from beginner to advanced, are included in the same class setting, which is a relaxed learning situation. Pam offers weekly sessions, during fall and spring. Students may join in at any time. I enjoyed looking at the variety of artwork on display. Landscapes shared space with a cheerful portrait, a unique vignette of bottles, painted on a triptych, a magnificent horse and a beautiful close up of a single iris. I couldn’t pick a favorite, as I appreciated them all. 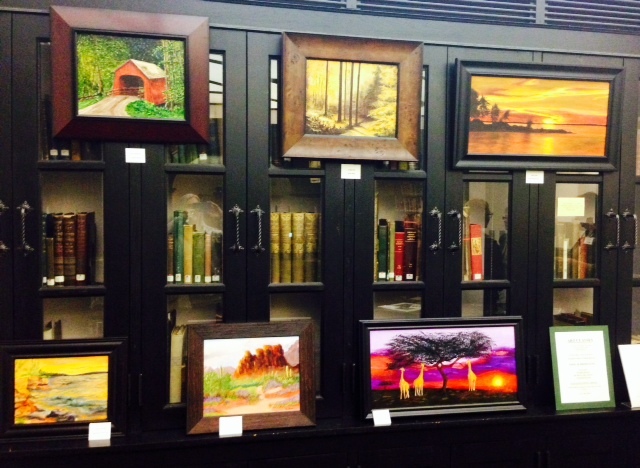 The student artists included in the exhibit are Joleen Davis, Vangie Hall, Rhonda Hayward, Ron Hayworth, Cecilia Hempen, Pam Lickteig, Mary Parks, Brenda Schatzley, and Diane Thornton. While at the exhibit I also got to say hi to Leslie and meet Post Library assistant, Jill Sullivan, just after she was interviewed by KOAM News. Jill shared about the Post Mail Art Projekt, and an upcoming workshop that will be held Saturday, November 15, at the library. The Projekt is a fun opportunity to create innovative correspondence and send it to the library, via snail mail. The deadline for entry is December 1, and the mail art will be showcased in an exhibit January, 2015. I won’t be able to attend the workshop, however I was excited to learn about mail art. I see another great first coming up, one I can share with grandson Dayan, and with the younger grandchildren, if they want to make a postcard too. I’ll share more about this exciting project, or “projekt”, later! What a perfect day to visit the exhibit at the Post Library. So often, that is the way my journey unfolds, leading me without effort to the next adventure.